Hypoplastic left heart syndrome (HLHS) describes a spectrum of cardiac abnormalities characterized by marked hypoplasia of the left ventricle and ascending aorta. This is the same disorder sometimes characterized as hypoplasia of the aortic tract complex. The aortic and mitral valves are atretic, hypoplastic, or stenotic. A patent foramen ovale or an atrial septal defect is usually present. The ventricular septum is usually intact. A large patent ductus arteriosus supplies blood to the systemic circulation. Systemic arterial desaturation may be present because of complete mixing of pulmonary and systemic venous blood in the right atrium. Coarctation of the aorta is also commonly present. Hypoplastic left heart syndrome is a uniformly lethal cardiac abnormality if not surgically addressed. Since the description of surgical palliation by Norwood in the early 1980s and the description of allograft cardiac transplantation by Bailey in the mid 1980s, the interest in this lesion has remarkably increased. Currently, the Norwood surgical approach consists of a series of 3 operations: the Norwood procedure (stage I), the hemi-Fontan or bidirectional Glenn procedure (stage II), and the Fontan procedure (stage III). Orthotopic heart transplantation provides an alternative therapy, with results similar to those of the staged surgical palliation. Currently, the survival rate of infants treated with these surgical approaches is similar to that of infants with other complex forms of congenital heart disease in which a 2-ventricle repair is not possible. Hypoplasia of the left heart structures is noted, with enlargement and hypertrophy of the right heart. Similar to other congenital heart defects, hypoplastic left heart syndrome also has a spectrum of severity. In the most severe form, aortic and mitral valve are atretic, with a diminutive ascending aorta and markedly hypoplastic left ventricle. The left atrium is usually smaller than normal, although it may be normal in size or enlarged. It receives all pulmonary veins. Pulmonary vein stenosis is a rare but important abnormality. The left ventricle is usually a thick-walled, slitlike cavity, especially when mitral atresia is present. When the mitral valve is perforate, the left ventricular cavity is small. Endocardial fibroelastosis is usually present. The aortic valve is either severely stenotic or atretic. The ascending aorta is often severely hypoplastic, measuring 2-3 mm in diameter, serving as a conduit to supply blood to both coronary arteries in a retrograde fashion. However, it may approach normal dimensions. 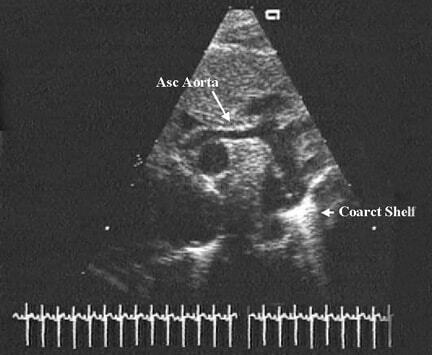 Coarctation of the aorta may be present in a significant number of patients with hypoplastic left heart syndrome, but interrupted aortic arch is rare. The right heart (ie, right atrium, right ventricle, pulmonary arteries) is markedly enlarged. Severely hypoplastic left ventricle can be present in hearts with double-outlet right ventricle and common atrioventricular canal; in some studies, these variants constitute as many as 25% of hypoplastic left heart syndrome cases. The oxygenated blood from the placenta is returned to the inferior vena cava and is not shunted preferentially across the patent foramen ovale into the left atrium; instead, it mixes with the superior vena caval blood in the right atrium. The pulmonary veins drain into the left atrium, and the pulmonary venous blood gets shunted across the atrial septum into the right atrium because of mitral valve obstruction. The vena caval and pulmonary venous blood along with the coronary sinus flow enters the right ventricle and the pulmonary artery. Larger quantity of flow across the ductus with a higher PO2, Whether these factors influence the development of ductal musculature, which may, in turn, influence postnatal ductal closure, is unclear. Retrograde coronary blood flow via a long channel with lower PO2, This abnormality is not believed to interfere with supply of normal quantities of oxygen and nutrients to the myocardium. However, whether myocardial reserve is adversely affected is unclear. The newborn infant with hypoplastic left heart syndrome has a complex cardiovascular physiology. Fully saturated pulmonary venous blood returning to the left atrium cannot flow into the left ventricle because of atresia, hypoplasia, or stenosis of the mitral valve. Therefore, pulmonary venous blood must cross the atrial septum. In most babies, a patent foramen ovale is present and is small and partially obstructive. This blood mixes with desaturated systemic venous blood in the right atrium. The right ventricle then must pump this mixed blood to both the pulmonary and the systemic circulations that are connected in parallel, rather than in series, by the ductus arteriosus. Blood exiting the right ventricle may flow (1) to the lungs via the branch pulmonary arteries or (2) to the body via the ductus arteriosus. The amount of blood that flows into each circulation is based on the resistance in each circuit. Incidence of hypoplastic left heart syndrome is 0.16-0.36 per 1000 live births. It comprises 1.2-1.5% of all congenital heart defects. Hypoplastic left heart syndrome accounts for 7-9% of all congenital heart disease diagnosed in the first year of life. Before surgical treatment was available, hypoplastic left heart syndrome was responsible for 25% of cardiac deaths in the neonatal period. The rate of occurrence is increased in patients with Turner syndrome, Noonan syndrome, Smith-Lemli-Opitz syndrome, or Holt-Oram syndrome. Certain chromosomal duplications, translocations, and deletions are also associated with hypoplastic left heart syndrome. Frequency is similar to that in the United States. Without surgery, hypoplastic left heart syndrome is uniformly fatal usually within the first 2 weeks of life. Survival for a longer period occurs rarely and only with persistence of the ductus arteriosus and balanced systemic and pulmonary circulations. The clinical features of hypoplastic left heart syndrome (HLHS) largely depend on the patency of the ductus arteriosus, the level of pulmonary vascular resistance, and the size of the interatrial communication. 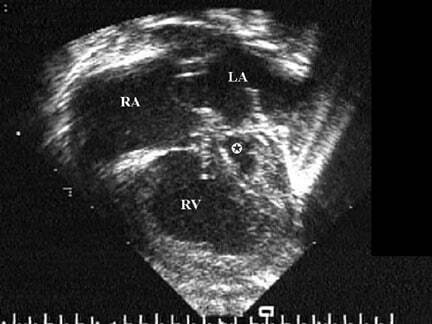 Although hypoplastic left heart syndrome can easily be detected on fetal echocardiography, many infants are not identified prenatally because routine obstetric ultrasonography examination may not concentrate on cardiac anatomy. A recent increase in use of routine prenatal ultrasonography and examination by obstetricians of the 4-chamber anatomy of the heart to ensure its normalcy are likely to identify hypoplastic left heart syndrome more frequently than in the past. Pregnancies are typically uncomplicated. The fetus grows and develops normally because the fetal circulation is not significantly altered. Most neonates are born at term and initially appear normal. Occasionally, respiratory symptoms and profound cyanosis are apparent at birth (2-5% of cases). In these infants, significant obstruction to pulmonary venous return (a congenitally small or absent patent foramen ovale) is usually present. As the ductus arteriosus begins to close normally over the first 24-48 hours of life, symptoms of cyanosis, tachypnea, respiratory distress, pallor, lethargy, metabolic acidosis, and oliguria develop. Without intervention to reopen the ductus arteriosus, death rapidly ensues. Similar symptomatology may be expected if a precipitous drop in pulmonary vascular resistance occurs. After reestablishment of systemic blood flow via the ductus arteriosus, signs of shock resolve, leaving the stable infant with tachycardia, tachypnea, and mild central cyanosis. If a coarctation of the aorta is present, arterial pulses in the legs may be more prominent than those in the arms, particularly the right arm. A prominent right ventricular impulse may be noted. A normal first heart sound may be observed. A loud single second heart sound may be present. The exact cause of hypoplastic left heart syndrome is unknown. Although familial cases with autosomal recessive inheritance have been reported, hypoplastic left heart syndrome is generally postulated to follow multifactorial mode of inheritance. Premature closure or absence of the foramen ovale represents another theoretical cause of hypoplastic left heart syndrome because it eliminates fetal blood flow from the inferior vena cava to the left atrium. Fetal pulmonary blood flow is not sufficient for normal development of the left atrium, left ventricle, and ascending aorta. Another postulated cause is misalignment of the atrial septum to the left. Recent studies suggest that hypoplastic left heart syndrome is genetically heterogeneous and hypoplastic left heart syndrome and bicuspid aortic valve are genetically related. No consensus has been reached in the approach to the treatment of neonates with hypoplastic left heart syndrome (HLHS). Supportive care, multistage surgical intervention (ie, Norwood, Glenn, and Fontan procedures) and cardiac transplantation are available options. A thorough explanation of each of these options, including their advantages and disadvantages, should be provided to the parents.Occasionally, some anatomic features favor one choice over the others. In the presence of severe tricuspid or pulmonary valve anomalies, the multistage surgical approach is not likely to be beneficial; cardiac transplantation is the only surgical choice. In most cases, the choice of treatment is based on the parents’ preference. While such a decision is being made, the infant should be stabilized.If supportive care is chosen by the parents, they need strong emotional support because the condition is fatal without active treatment. Successful preoperative management depends on providing adequate systemic blood flow while limiting pulmonary overcirculation. Blood flow to the systemic circulation (coronary arteries, brain, liver, kidneys) depends on flow through the ductus arteriosus. If a diagnosis of hypoplastic left heart syndrome is suspected, start prostaglandin E1 infusion immediately to establish ductal patency and ensure adequate systemic perfusion. If the diagnosis is made prenatally or when the infant is relatively asymptomatic, a smaller dose of prostaglandin E1 may be sufficient to keep the ductus arteriosus patent while limiting its side effects. A larger dose of prostaglandin E1 is often required to reopen the ductus arteriosus if an infant has cardiovascular collapse and shock due to ductal closure. Ideally, prostaglandin E1 is administered centrally via an umbilical venous catheter. Metabolic acidosis indicates inadequate cardiac output to meet the metabolic demands of the body. Acidosis adversely affects the myocardium. Correction of metabolic acidosis with sodium bicarbonate infusion is essential in early management. This therapy is futile if the ductus arteriosus remains constricted. The pulmonary vascular resistance of a newborn is slightly less than the systemic vascular resistance and begins to fall soon after birth. In the patient with hypoplastic left heart syndrome, decreased pulmonary vascular resistance causes increased pulmonary blood flow and an undesirable obligatory decrease in systemic blood flow. Increased alveolar oxygen decreases pulmonary vascular resistance, leading to increased pulmonary blood flow. Therefore, oxygen should not be administered unless pulmonary parenchymal disease or pulmonary edema, causing severe hypoxemia, is present. The oxygen should be discontinued once these abnormalities resolve. Consequently, most infants should remain in room air with acceptable oxygen saturation (pulse oximeter) in the low 70s. An exceptional circumstance is the infant with severe hypoxemia caused by pulmonary venous hypertension. Achieving a slightly higher PaCO2, in the range of 45-50 mm Hg, can increase pulmonary vascular resistance. This can be accomplished by intubation, sedation, mechanical hypoventilation, or the addition of nitrogen or carbon dioxide (FIO 2 of 15-19%) to the infant’s inspired gas via the endotracheal tube or hood. Intubation is not preferred. However, intubation and ventilation along with measures to balance pulmonary and systemic flows may improve tricuspid regurgitation. Serial blood gas analysis is necessary. Initially, an umbilical arterial catheter is useful to obtain frequent blood samples. Although administration of subambient inspired oxygen to balance systemic and pulmonary blood flows is an attractive concept and should be applied during stabilization of the neonate, it should not be pursued for long periods because severe pulmonary hypertension may complicate the postoperative course. However, this does not seem to adversely affect the pulmonary vasculature on long-term follow-up. Inotropic support is indicated only in severely ill neonates with concurrent sepsis or profound cardiogenic shock and acidosis. The administration of inotropes can adversely affect the balance between pulmonary and systemic vascular resistance. If needed, wean from inotropic support as soon as the infant is clinically stable. Consider diuretics to manage pulmonary overcirculation before surgery. Agents commonly used include furosemide and spironolactone. Antibiotics are indicated if the infant is at risk for antepartum infection. Discontinue antibiotics after obtaining negative blood cultures. Sinha and associates, Caylor and colleagues, and Dotty and associates proposed various palliative operations; however, survival was not feasible until Norwood and associates demonstrated that a multistage operative approach could be used to treat hypoplastic left heart syndrome. After Fontan and Kreutzer’s initial description of the physiologically corrective operation for tricuspid atresia, corrective surgery was widely adapted to treat this entity. The concept was extended to treat other cardiac defects with a functionally single ventricle, including hypoplastic left heart syndrome. The originally described Fontan operation consisted of the following: (1) superior vena cava–to–right pulmonary artery end-to-end anastomosis (Glenn procedure), (2) anastomosis of the proximal end of the divided right pulmonary artery to the right atrium directly or by means of an aortic homograft (3) closure of the atrial septal defect, (4) insertion of a pulmonary valve homograft into the inferior vena caval orifice, and (5) ligation of the main pulmonary artery, thus completely bypassing the right ventricle. Kreutzer performed anastomosis of the right atrial appendage and pulmonary artery directly or via a pulmonary homograft and closed the atrial septal defect. A Glenn procedure was not performed, and a prosthetic valve was not inserted into the inferior vena cava. Fontan’s concept was to use the right atrium as a pumping chamber; therefore, he inserted prosthetic valves into the inferior vena cava and right atrial–pulmonary artery junction. Kreutzer’s view was that the right atrium may not function as a pump and that the left ventricle functions as a suction pump in the system. Numerous modifications to the aforementioned procedures were undertaken by these and other workers in the field. Currently, staged total cavopulmonary connection is the procedure of choice. This procedure is usually performed during the first weeks of life, after the infant has been stabilized in the neonatal intensive care unit (ICU). The goals of the procedure are (1) to establish reliable systemic circulation without the ductus arteriosus and (2) to provide enough pulmonary blood flow for adequate oxygenation, while simultaneously protecting the pulmonary vascular bed in preparation for stages II and III. The Norwood procedure includes (1) performing an atrial septectomy to provide unrestricted blood flow across the atrial septum, (2) ligating the ductus arteriosus, (3) creating an anastomosis between the main pulmonary artery and the aorta to provide systemic blood flow, (4) eliminating coarctation of the aorta, and (5) placing an aorta–to–pulmonary artery shunt (usually a modified Blalock-Taussig shunt) to provide pulmonary circulation. More recently, connecting a Gore-Tex graft from the right ventricular outflow tract to the pulmonary artery (ie, Sano operation) has been advocated instead of conventional modified Blalock-Taussig shunt; some surgeons have shown better results with the Sano procedure than with the conventional Norwood approach. Upon hospital discharge, most infants remain on digoxin to augment cardiac function, on diuretics to help manage right ventricular volume overload, and on aspirin to prevent thrombosis of the shunt. If tricuspid regurgitation is present, use afterload reduction with captopril. Oxygen saturation is typically 70-80% in room air. This procedure is performed approximately 6 months after the Norwood procedure. Before surgery, perform a cardiac catheterization to assess right ventricular function, pulmonary artery anatomy, and pulmonary vascular resistance. If results are favorable, schedule elective surgery. The bidirectional Glenn procedure includes creating an anastomosis between the superior vena cava and the right pulmonary artery, end-to-side so that venous return from the upper body can flow directly into both lungs. In the hemi-Fontan, the superior vena cava–right atrial junction is closed with a patch that is removed during the next stage. Blood from the inferior vena cava continues to drain into the right atrium. The aorta–to–pulmonary artery shunt that was placed at stage I is ligated. When both right and left superior vena cavae are present, bilateral bidirectional Glenn shunts should be performed, especially if the bridging innominate vein is absent or small. At the time of bidirectional Glenn, repair of pulmonary artery narrowing, if present, should be undertaken. Issues related to tricuspid valve regurgitation, restrictive atrial septum and any other abnormalities should also be addressed. At discharge, infants usually remain on digoxin, diuretics, aspirin, and captopril for the reasons mentioned above. The Fontan procedure is performed approximately 12 months after the bidirectional Glenn procedure. Again, catheterization is necessary to ensure that the child is a candidate for surgery. Completion of the Fontan procedure includes directing blood flow from the inferior vena cava to the pulmonary arteries either via a lateral tunnel procedure or via an extracardiac conduit. Extracardiac conduit diversion of inferior vena caval blood into the right pulmonary artery is currently preferred by most surgeons. To address the growth issue related to extracardiac Fontan, some surgeons use autologous pericardial roll grafts. At the conclusion of the procedure, systemic venous blood returns to the lungs passively without passing through a ventricle. At discharge, most children remain on digoxin, diuretics, aspirin, and captopril if necessary. In an uncomplicated case, most of these medications can be weaned over 6 months following the Fontan operation. Some cardiologists advocate using aspirin indefinitely. Routine use of more aggressive anticoagulation with Coumadin is debated. Heart transplantation is another surgical option. The infant must remain on prostaglandin E1 infusion to keep the ductus arteriosus patent while waiting for a donor heart to become available. Approximately 20% of infants listed for heart transplantation die while waiting for a suitable donor organ. After successful cardiac transplantation, infants require multiple medications for modulation of the immune system and prevention of graft rejection. Perform frequent outpatient surveillance to identify rejection early and prevent lasting damage to the transplanted heart. Periodic endomyocardial biopsy usually is performed for more precise monitoring. Following Norwood procedure, 2-stage cavopulmonary connection is currently recommended for achieving Fontan circulation. Konert et al proposed a staged surgical-catheter approach; they initially perform a modified hemi-Fontan procedure that is later completed by transcatheter methodology. This reduces the total number of operations required. The modified hemi-Fontan procedure involves the usual bidirectional Glenn procedure. The lower end of the divided superior vena cava is anastomosed to the undersurface of the right pulmonary artery. The superior vena cava is then banded around a 16-gauge catheter with 6-0 Prolene slightly above the cavoatrial junction. A lateral tunnel with a Gore-Tex baffle is created, diverting the inferior vena caval blood toward the superior vena cava. The Gore-Tex baffle is then fenestrated with three to five 5-mm holes. Thus, the first stage achieves a physiologic bidirectional Glenn procedure. At the time of the second stage (the transcatheter stage), the superior vena caval constriction is balloon dilated, and fenestrations are closed with devices or by placement of covered stent. These procedures have been performed in a limited number of patients, and preliminary data suggest that the usual post-Fontan operation complications, such as pleural effusion and ascites, have not occurred with this approach. Additional experience is reported; however, scrutiny of results of larger experience and longer-term follow-up and ready availability of covered stents are necessary for routine application of this innovative approach. Because of high mortality that Sano and his associates observed with the conventional Norwood procedure, they performed right ventricular outflow–to–pulmonary artery Gore-Tex graft anastomosis to provide for the pulmonary blood flow instead of conventional modified aortopulmonary shunt. Significant improvement was demonstrated in both immediate and late mortality with this modification. Currently, an ongoing multi-institutional study is comparing the results of these 2 types of stage I palliation of hypoplastic left heart syndrome. Other hybrid approaches: Again, because of high mortality following stage I Norwood reconstruction, several groups have performed bilateral banding of the branch pulmonary arteries via median sternotomy and implant stent in the ductus arteriosus. Maintaining ductal patency with long-term prostaglandin infusion instead of ductal stenting is advocated by some. At the time of the second stage, aortic arch reconstruction, atrial septectomy, and bidirectional Glenn shunt are performed. This is followed by Fontan conversion. Although reduction of early mortality is theoretically feasible, larger experience with this approach than is currently available is necessary prior to general adaptation of this method of management of hypoplastic left heart syndrome. Prevention by fetal intervention: Fetal echocardiography studies have shown development of hypoplastic left heart syndrome in fetuses initially found to have severe/critical aortic stenosis. Some data suggest that fetal intervention to relieve aortic valve stenosis (by balloon aortic valvuloplasty) may promote normal development of the left ventricle. Further research into this type of approach is needed. Consult a pediatric cardiovascular surgeon. Consult a genetic specialist if a chromosomal abnormality is suspected. Consult an interventional pediatric cardiologist. Adequate nutrition is important before and after surgery. Many infants require nasogastric feeding with increased-calorie breast milk or formula after the Norwood procedure. However, normal oral feeding is reestablished with time. Adequate oral iron intake prevents development of iron deficiency anemia. After completion of the Fontan operation, specific dietary restrictions are not necessary unless protein-losing enteropathy develops. In such cases, a medium-chain triglyceride diet may be helpful. Specific activity restrictions are not imposed on children after completion of the Fontan operation. In general, encourage children to participate in activities that they are able to tolerate. Children who underwent a Fontan procedure may not be able to tolerate highly competitive sports. Studies have shown that these children may have impaired exercise performance when compared to age-matched peers. Perform an exercise stress test when the child is old enough. Neurodevelopmental abnormalities occur often in patients with hypoplastic left heart syndrome. Before the Norwood procedure or cardiac transplantation in patients with hypoplastic left heart syndrome (HLHS), treat infants with prostaglandin E1 infusion, diuretics, inotropes, and afterload reduction. Drug management after cardiac transplantation is not discussed in this article. Prostaglandin E1 promotes dilatation of the ductus arteriosus in infants with ductal-dependent cardiac abnormalities. These agents decrease preload by increasing free-water excretion. Decreasing preload may improve systolic ventricular function. These medications improve ventricular systolic function by increasing the calcium supply available for myocyte contraction. These agents stimulate alpha-adrenergic and beta-adrenergic and beta-dopaminergic receptors in the heart and vascular bed. Afterload reduction improves myocardial performance and theoretically reduces atrioventricular and semilunar valve insufficiency. These agents are used in the treatment or prevention of thrombo-occlusive disease mediated by the action of platelets. They inhibit platelet function by blocking cyclooxygenase and subsequent aggregation. Initial preoperative management and postoperative care of hypoplastic left heart syndrome (HLHS) take place in the neonatal, pediatric, or cardiac ICUs. When postoperative patients are clinically stable, transfer them to the general cardiac unit for adjusting oral medications, addressing feeding issues, and completing discharge teaching. Involve a pediatric cardiologist during any noncardiac hospital admission of a patient who is status post (S/P) Norwood procedure. This is because of the complex cardiovascular physiology in infants after this surgery. Hospitalization and inpatient care may be required for cardiac catheterizations, catheter interventions, surgical procedures and for treatment of intercurrent infections as well as for management of postsurgical complications, including those after Fontan operation. Schedule outpatient follow-up care 2 weeks after discharge in the typical postoperative patient. Schedule those who are S/P cardiac transplantation earlier for necessary laboratory studies. Earlier follow-up care is also necessary if a pericardial effusion is discovered on the discharge echocardiogram. Periodic follow-up visits after stage I, II, and III operations are mandatory. Individualize outpatient follow-up care based on the needs of each patient. Transfer the infant to a hospital with appropriate ICUs. Pediatric cardiology and cardiovascular surgery services must be immediately available. Carefully monitor the infant for apnea during transfer while on prostaglandin E1 therapy. If prostaglandin E1 has been started, consider elective endotracheal intubation before transfer. Major complications following the Norwood procedure include aortic arch obstruction at the site of surgical anastomosis and progressive cyanosis caused by limited blood flow through the shunt. An inadequate atrial communication contributes to progressive cyanosis. Overall survival to the time of hospital discharge after the Norwood procedure is nearly 75%. Success rates are higher in uncomplicated cases and lower in cases in which important preoperative risk factors are present, such as age greater than 1 month, significant preoperative tricuspid insufficiency, pulmonary venous hypertension, associated major chromosomal or noncardiac abnormalities, and prematurity. High Aristotle scores (>20) are associated with high hospital mortality and low survival at follow-up. Low cerebral near-infrared spectroscopy oxygen saturations during the first 48 hours after Norwood procedure are strongly associated with adverse outcomes. General: At the outset, appropriately warn the parents and other caregivers that hypoplastic left heart syndrome is a complex heart defect that requires multiple hospitalizations, surgeries, catheter interventions and long-term follow-up. Educate parents regarding the doses and side effects of their child’s cardiac medications. Discuss interactions with other medications with the family and the infant’s general pediatrician. Many infants require nasogastric tube feeding after discharge from the hospital. Parents must become comfortable with placement of the nasogastric feeding tube. The newborn with hypoplastic left heart syndrome (HLHS) dies rapidly if untreated. Surgical techniques, both reconstruction and heart transplantation, offer an opportunity to preserve the newborn’s life. Survival rates given above represent the best results and reflect only survival, not quality of life. Mortality rates in many centers exceed those mentioned. Incidence of neurodevelopmental abnormalities in hypoplastic left heart syndrome appears to exceed that of other single-ventricle conditions. Hypoplastic left heart syndrome affects family structure. For example, reproductive studies indicate that the incidence of subsequent pregnancy is significantly lower in mothers of a living patient with hypoplastic left heart syndrome than in mothers after death of an infant with hypoplastic left heart syndrome. For these reasons, most pediatric cardiologists continue to offer no treatment as an acceptable option to parents of a newborn with hypoplastic left heart syndrome. It is incumbent on physicians caring for a newborn with hypoplastic left heart syndrome to clearly communicate all of this information to the parents. An ethically appropriate consent for surgery requires this. Allowing an affected infant to die without surgical intervention is a difficult decision but is still chosen by some families and should not be discouraged. Ethical issues related to transplantation compared with multistage reconstructive surgery were recently reviewed. Although the decision regarding this choice must be made in the best interest of the infant with hypoplastic left heart syndrome, considerations such as interests of the family members and society-at-large may have to be taken into account. If you took Zoloft (sertraline), Prozac (fluoxetine), Celexa (citalopram), Paxil (paroxetine) or another SSRI antidepressant drug during pregnancy and your child was born with hypoplastic left heart syndrome (HLHS) or any other serious congenital heart, lung or other birth defect, we encourage you to contact an SSRI Litigation Attorney at our law firm immediately. It may be too late to recover from the devastating effects of Zoloft (sertraline), Prozac (fluoxetine), Celexa (citalopram) and Paxil (paroxetine), but an experienced products liability lawyer at the Willis Law Firm can assist you in a legal action against the makers of these drugs. You are not alone. Join other birth defect victims and their families in speaking up and fighting for your legal rights.